"Light and Easy to use the Jetboil GCS brings water to boil faster than any other stove, but there are some durability concerns." I actually used to complain about this stove a lot until I watched my friend almost blow himself up with another stove. 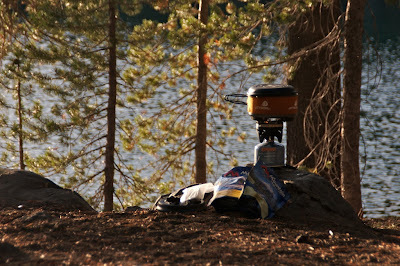 There is no priming system, nothing complicated at all about the JetBoil GCS. What's more it brings water to boil faster than any other commercially available stove. A difference that is seemingly minor but multiplies at high altitude. The Jetboil Group Cooking system does have its weaknesses, but when it comes down to it the Jetboil GCS is powerful enough for a demanding backcountry user and easy enough for a beginner to use. While the Group Cooking System has legacy potential its durability is a concern: The built in lighter is not fully reliable and I keep a lighter with my kit, many users have also reported their lids warping and no longer fitting after cold weather use. Mine warped on a mere 33 degree night in Mt. Lassen. Once the top warps the whole system starts to rattle around inside your pack, spilling its contents out and collecting more dirt. Whats more the top will let heat out, and after repeated use get so warped it blows away in strong winds, sometimes taking the whole system with it. The fact is the JetBoil Group Cooking System, lid problems or not, is a lightweight and solid performing piece of technology that works especially well when all you need to do is boil up some water. Because of the lack of temperature controls its tough to cook more complicated dishes but I can't say I've ever missed that feature in practice.